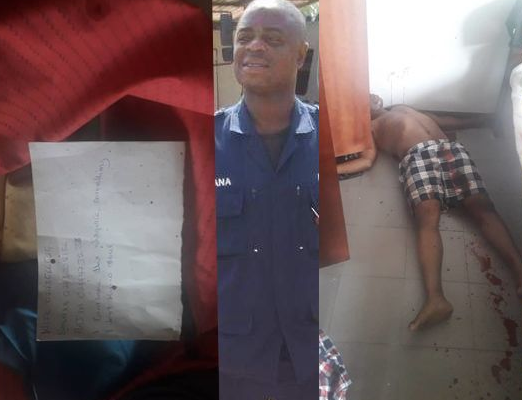 One of the two police officers being investigated for the alleged theft while on duty at Osagyefo Power Barge at Efassu near Half-Assini in the Western Region, has shot himself dead, Ghanaguardian.com has learnt. The officer, Sgt Fuseini Mohamuda with badge no. 37400 “shot himself dead with an AK47,” on Saturday at about 8:30 am, according to a Police report. That was after he sent CPL Iddrisu Kafando Muntari with badge no. 551484L, whom he was on duty with to buy him a shaving blade, the report said. Sgt Mohamuda left a note denying his involvement in the theft saying: “ can't take this disgrace, something I don't know anything about”. Sgt Mohamuda’s remain has since been transported to the Police Hospital Morgue in Accra for preservation and autopsy.